300,000 people are dead. Millions have become refugees. Among the fanatical colossus of anti-government forces in Syria, vile ISIL terrorist organization has emerged, unleashing horrors in Lebanon, Belgium, France, and elsewhere. Yet, western leaders do not end their mantra of “Assad Must Go!” and continue efforts to make the country less stable. It seems not to matter how many innocent people have to die, or how strong the dangerous terrorist “opposition” gets, western leaders seem unwilling to abandon their goal of regime change. If the Syrian government were to fall, the results would be grim. The Al-Nusra Front, ISIL, and even a number of the forces the USA has called “moderate” are devoted to establishing a Sunni caliphate. Syria’s religious minorities, the Christians, the Alawites, and others could face either forced deportation, or even outright extermination. Russia, along with Iran, China, and Venezuela, have come to the aid of the secular, internationally recognized Syrian government, in the hopes of holding back the wave of extremism. The Syrian city of Aleppo is now divided, with the eastern section of the city under the control of various anti-government factions, including the US backed so-called “moderate” rebels, as well as the Al-Nusra terrorists, who were directly linked to Al-Queda until recent months. Despite their efforts to protect innocent life, Russia and the Syrian government have been forced to fight against the Al-Nusra terrorists and their allies in close proximity to civilians.As Russia fights to retake the city from anti-government extremists, the US media suddenly has developed a concern for the civilian casualties of war. Allegations of Russian war crimes in Aleppo have filled the airwaves and the speeches of western leaders. Meanwhile, anti-government forces continue to shell civilian areas in the western side of the city. Western media ignores the cries of these civilians, while doing everything to demonize the Syrian government and Russia. The hypocrisy shouldn’t be missed by anyone. Some of very same individuals that backed the US invasion of Iraq which caused hundreds of thousands of innocent civilians to die, now voice “humanitarian” outrage about Aleppo. The leaders of NATO, who reduced Libya, then the most prosperous African country, to rubble, now bemoan the impact of war on civilian populations. The very same voices that long dismissed civilians killed by airstrikes, have now discovered that what they once called “collateral damage” indeed has human rights. At the same time the Russia works with the Syrian government to retake Aleppo, the Kingdom of Saudi Arabia is conducting a relentless bombing campaign against the people of Yemen. There is no dispute that the Saudi attack on Yemen is violating human rights. The UN has documented that civilian targets are being intentionally hit. But no pressure whatsoever is being placed on Saudi Arabia to ends slaughter of Yemeni civilians. The western governments continue to actively assist their Saudi “allies” as they violate international law in Yemen, while demonizing Russia’s cooperation with Syria against terrorism. When speaking of Aleppo, western leaders employ language that is quite similar to the kind often used by left-wing anti-war activists. The British Foreign Secretary, Boris Johnson, even called for anti-war protests targeting Russia when speaking before parliament on October 11th. On November 3rd, a group of 25 people wearing “Save Aleppo” T-Shirt presented themselves outside of the Russian embassy in London, and appeared to be following Johnson’s directive. They brought with them a truck full of manikin arms and legs. They proceeded to dump these arms and legs in pile in front of the embassy, effectively blocking its doors and preventing anyone from leaving or entering. The manikin arms and legs were said to symbolize the innocent people of Aleppo, whose deaths they blamed on Russia. The police did not halt this demonstration, which appeared to have barricaded a foreign mission. As the protest continued, some of the provocative individuals in “Save Aleppo” T-shirts are reported to have chained themselves to the fence surrounding the embassy’s perimeter. Yet, it appears that not a single arrest was made. The police, who were on hand, apparently did not stop the individuals. So, who were these individuals? The money for the protest was supplied by “Syria Campaign.” This is non-profit organization funded by a Syrian billionaire named Ayman Asfari, in addition to other anonymous sponsors. It makes sense that a billionaire of Syrian descent, residing in Britain, would want to topple the “Baath Arab Socialist Party” that has run his country for many decades. Parallels between Asfari and the many wealthy Cuban residents of Miami are easy to make. The Syrian government, like the Cuban government, has provided housing, healthcare, and education to its population, achieving this with policies that make the richest people quite uncomfortable. But beyond Asfari’s well-funded “Syria Campaign” that uses its huge endowment to spread propaganda against the Syrian government and its allies, who were the individuals in the T-shirts? Very few of them appeared to be of Syrian origin, but one cannot assume they were merely hired stooges either. The answer to this question can be found in the name of an organization that co-sponsored the malicious provocation. The organization “Syria Solidarity UK,” which took credit for the action on its website, is well known to be a front group for the Socialist Workers Party of Britain. This “socialist” organization follows the teachings of Tony Cliff and Leon Trotsky, has its grip on Britain’s “Stop The War Coalition” as well. It is safe to surmise that a decent percentage of those who barricaded the Russian embassy’s entrance were Trotskyites. 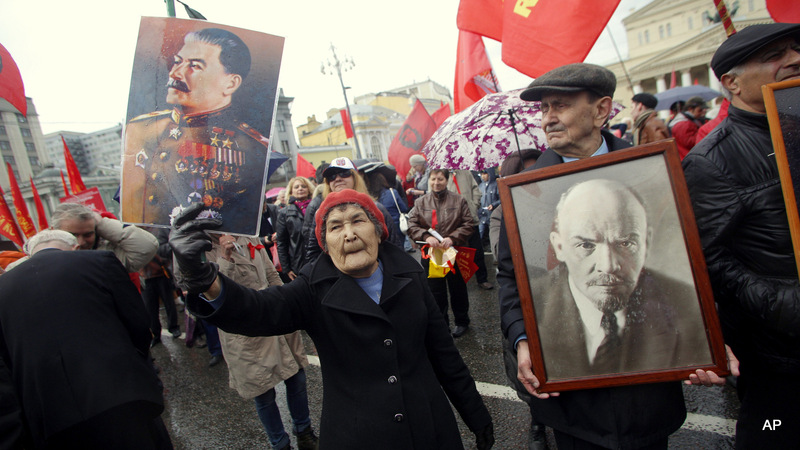 Communists carry portraits of former Soviet leaders Josef Stalin, left, and Vladimir Lenin as they march along Kremlin Towers during a May Day demonstration in Moscow, Friday, May 1, 2015. So, who are the Trotskyists? To answer this question we must begin to examine the anatomy of the political left throughout the course of the 20th century. Within the mass movements associated with Marxism, there are wide variety of sects, ideologies, and interpretations. However, among the individuals envision and work toward the overthrow of capitalism there are two distinct personal or psychological categories. These two trends often work in concert with each other. The two trends often do not even intentionally dissociate with each other, and can often be found within the same political parties and movements, despite the huge differences between them. The differences are found in motivation. Among the political left, the primary and constant current is an extremely alienated minority from within the privileged sectors of society. In Russia it was a current among the children of the aristocracy, as well as from within the emerging bourgeoisie, who made up much of the cadre of the Bolshevik Party in its early years. While they born in relatively comfortable positions, they knew that things in society at large were deeply wrong. They saw the suffering of the poor, and the many other injustices that existed, and were filled with anger and motivation to correct them. While other members of their social caste could be at peace with society, they could not. Whether it is due to their unique access to education, or the fact that they encouraged to ponder political and philosophical questions while other strata are not; regardless of the reason, a section of the most privileged people always seems to be drawn to revolutionary anti-capitalist politics. The trend is not restricted to pre-revolutionary Russia. One can think of the young French radicals depicted in Victor Hugo’s novel Les Miserable, or even the radicals of Students for a Democratic Society or the Weather Underground in the United States, who came from some of the prestigious Universities. No matter how strong or weak the leftist current is in society at large, a certain sector of the privileged classes exists as a kind of “radical intelligentsia.” This is true even in under the most repressive anti-communist dictatorships. The second current, which constitutes a very solid majority of those attracted to leftist and anti-capitalist currents around the world, are those among the working and impoverished classes. While in times of prosperity they are less politicized, as they see their conditions deteriorating, they become motivated to take action and embrace anti-capitalist and revolutionary ideology. Unlike the first current, their motivation is not a moralistic impulse based on alienation, but rather the basic desire to see their lives improve. This does not mean that such people do not have political depth or brilliance. Often these forces are actually much more politically effective and ideological. However, their introduction to revolutionary politics originates in a basic material need. While these two distinct political current espouse the same phrases and philosophies, they seem to crave two different things. The privileged children of the wealthy who embrace revolutionary politics often have a deep desire to create chaos. They see the world as unjust and cruel. They want it to be smashed, shattered, burned to the ground, and rebuilt anew. The second current, while espousing the same political line, tends to crave the opposite. They are motivated to take political action as society is becoming less stable. The economic crisis has made their lives more painful and unpredictable, intensifying the suffering all around them, pushing them toward a desperate need for radical change. They embrace anti-capitalism because it offers stability beyond the “anarchy of production.” The revolutionary left is for them, not the road to chaos and revenge, but the path toward a new order with a centrally planned economy, in which justice is created and the chaos is ended. Lenin’s book “What Is To Be Done?,” which laid the foundation for the Bolshevik project of a Central Committee and a “Party of a New Type,” was largely directed at members of the first, moralistic, and privileged group. It urged them to look past their own motivations, abandon terrorism and tailism, and build an highly disciplined organization that could push the broader masses of Russian workers and peasants toward a full revolution. The October Revolution of 1917 was successful because it merged the two trends. In a time of crisis, the revolutionary intelligentsia who longed to smash the old order, were able to mobilize the workers and peasants who were suffering and desperately wanted “Peace, Land and Bread.” The effective convergence of these two currents created a new political and economic system. However, almost immediately after the Soviet Union was founded, political space began to develop between the two trends. Lenin banned factions in the Bolshevik Party during the early 1920s in order to hold an increasingly divided ruling party together. Despite the ban on factions, the two trends did not cease to exist. After Lenin’s death, they two poles became personified in Leon Trotsky and Joseph Stalin. Trotsky, the son of wealthy landowners in Ukraine, who had lived in exile most of his life and was beloved among the world’s cosmopolitan intellectuals, called for “Permanent Revolution.” The Soviet Union, in his view, should exist simply as a temporary hold out in a global revolutionary explosion. In his view, Soviet society should be organized around the military, and focus primarily on seizing the western financial centers of Germany, Britain, and France for the global socialist project to remake all humanity. Stalin on the other hand called for “Socialism in one country.” He advocated for the Soviet Union to focus on building a good society for the people of Russia and the surrounding countries, while offering limited supported to revolutionary forces around the world. “Socialism in One Country” would require signing treaties with the western countries, restoring the traditional family, and eventually even legalizing the Russian Orthodox Church. For Stalin and the majority of the Communist Party of the Soviet Union, socialism did not meet an endless global crusade to behead every last king and capitalist, but rather, building a peaceful, prosperous society with a planned economy in Russia and the surrounding countries. When Stalin was victorious, the world communist movement began to shed the most adherent members of the first revolutionary category. The Communist parties began building unemployment councils, trade unions, and other organizations dedicated to aiding working people and fighting for direct material gains as capitalism collapsed into a “great depression.” Eventually the “Stalinists” built a People’s Front of anti-fascists that played a decisive role in the Second World War. 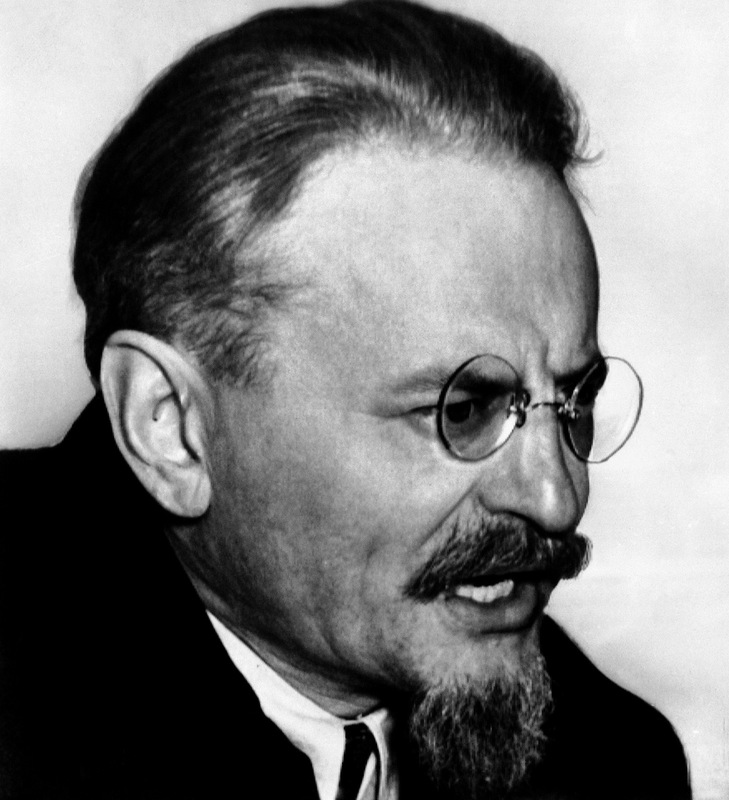 Meanwhile, Trotsky took a significant number of western intellectuals out of the Communist International and into his “Fourth International.” The Trotskyists worked to antagonize and isolate the Soviet aligned Communist Parties, while at the same presenting a negative perception of the Soviet Union as a “totalitarian” and “repressive” society that did to live up to the utopian dreams of middle class radicals. Trotsky saw the USSR as “degenerated workers state,” socialist in its economic foundations but “bureaucratized” in its politics. In the final years of his life, a number of Trotsky’s followers disagreed with this assessment and argued that the USSR was capitalist. Max Shachtman, Irving Kristol, and a number of the more middle class elements broke with Leon Trotsky, arguing that the USSR was not a “worker’s state” but rather “bureaucratic collectivism”, “state capitalism”, or fascism. These elements called themselves “Third Camp” or “Neo-Trotskyists.” The International Socialist Tendency, of which the British Socialist Workers Party is aligned, along with the US International Socialist Organization, is the largest continuer of these politics. It is “Third Camp Trotskyists” in Britain who have built the organization called “Syria Solidarity UK” which conducted the recent protests against the Russian embassy. Interestingly, it is from within the “Trotskyists” who broke with Trotsky, and completely denounced the USSR, that one can find the origins of Neo-Conservative thought in the United States. James Burnham, Edmund Wilson, Max Eastman, and many of the leading right-wing intellectuals of the Cold War were era were originally Trotskyists. Zbigniew Brzezinski, one of the leading CIA strategists during the Cold War, can largely be credited for defeat of the Soviet Union. Brzezinski’s career involved fomenting dissent and unrest in Soviet aligned countries. The gap between revolutionary intellectuals who crave chaos and revolution, and the pragmatic approach of Soviet leaders who wanted a stable, planned economy was a great asset to his activities. The CIA launched the “Congress for Cultural Freedom” to fund anti-Soviet leftists and artists, and further the space between them and the USSR. Brzezinski openly bragged that he was “giving the USSR its Vietnam War” in Afghanistan. When the People’s Democratic Party took power in 1978, the CIA worked with the Saudi monarchy to launch a global campaign of Wahabbi Muslims against it. The USSR sent its forces into Afghanistan to protect the People’s Democratic Party. In the global media, it was a different story. The press painted the Taliban and other forces organized by Osama Bin Laden as romantic guerilla fighters, battling against the USSR, portrayed as a crude, repressive invading force. The “Trotskyists” of the world embraced the Mujahadeen Wahabbi fanatics in much the same manner that such forces now embrace the Free Syrian Army and the Al-Nusra Front. Among the organized left, pro-Soviet sentiments were left only to a small minority, dubbed “Stalinists” and “Hardliners.” The long-haired, counter-cultural “New Left” bought into the CIA narrative, and believed that Osama Bin Laden was some kind of Che Guevara. In the 21st century, Anti-imperialist governments, even those who completely reject Marxism-Leninism, have learned a lot in common with the political and economic system developed by Stalin during the 1930s. Anti-imperialist countries tend have five year economic plans or other mobilizations of the population toward raising the living standards. They tend to have a ruling party with a very complex and specific ideology, that sits at the center of a tightly organized and politicized population. The strength of the various anti-imperialist regimes is their ability control the centers of economic power, raise the standard of living, and provide a comfortable life for the majority of their people. In China, each child is given a red scarf when they begin their education. They are told that this red scarf is their own piece of the Chinese flag, and that it represents a political project toward building a prosperous society, which they are automatically part of it. Similar rituals exist in the Bolivarian countries, the Arab Nationalist states, and almost every other country where the government can trace its origin to an anti-capitalist revolution. Meanwhile, the primary strategy of Wall Street for toppling these governments has been to employ the rhetorical style of Trotskyists, and appeal to the alienation and anxiety of the privileged elite. The CIA and its network of aligned NGOs has discovered key methods of manipulating and unleashing the desire for chaos among the middle class. Figures like Samantha Power talk about “mobilizing” for human rights around the world. The primary way the US has attacked independent countries in recent years has been fomenting revolts such as Euro-Maiden in Ukraine, the “Green Movement” in Iran, the “revolution” in Libya. These uprisings are supported by Non-Governmental Organizations and carried out to serve the interests of the western financial elite. While they effectively maintain the global status quo, they are decorated with the most Guevara and Trotsky-esque propaganda on social media and western television. It seems pretty clear that the vaguely emotional lust for revolution and unrest among the alienated middle class has been effectively harnessed as mechanism for defeating “Stalinism” and ensuring the rule of western capitalists. The Council on Foreign Relations, the CIA-linked think tank, shed light on its worldview and strategy in the latest issue of their publication Foreign Affairs. In an essay by Anne-Marie Slaughter, one of the primary architects of the US backed regime change operation in Libya, she described her prescription for the ailments of the global situation. “The people must come first,” she tells us, like a soap-box agitator. “When they do not, sooner or later they will overthrow their governments.” According to Slaughter, the job of western countries is to facilitate the free flow of information through social media, in order to allow these uprising to come about. Furthermore, Slaughter argues that the Treaty of Westphalia, and the concept of the nation state is out of date. Rather “responsibility to protect” or R2P has replaced it. The NATO states and their military must intervene in order to strengthen these revolutions, and topple regimes that get in Wall Street’s way. The strategy is global revolution, endless destruction and chaos until “open governments, open societies and an open international system” can be erected. We can almost hear echoes of Trotsky’s fantasy of “permanent revolution” in Slaughter’s writing, though Trotsky’s stated goal was to overturn capitalism, not secure its grip on the planet. And who are the villains in the CFR narrative? They are “Populists.” The entire issue of “Foreign Affairs” is titled “The Power of Populism.” Listed among them are Hugo Chavez, Evo Morales, the Supreme Leader of Iran, as well as Russian President Vladimir Putin and Chinese President Xi Jinping. According the analysis, it is these dangerous “demagogues” who reject the “open international system” of the World Bank and the International Monetary Fund, but instead mobilize their populations and preside over centrally planned economies that must be smashed. With the word “Populism”, the CFR’s seeks to link these governments to racism and anti-immigrant bigotry in western countries, and urge “progressive” and “enlightened” people to oppose them in the same manner. Indeed, political navigation in the 21st Century is can be quite difficult. The compass by which analysts have long determined left and right is broken. The defenders of free market capitalism and the rule of internationalist bankers have embraced the revolutionary bloodlust which was long a staple of the political left. Meanwhile, the anti-imperialists and advocates of planned economies now often position themselves as social conservatives and defenders of stability, morality, religion, and tradition. While it is no longer exactly clear which way is “left” or “progressive,” it is blatantly obvious which way is better for the human race. The NATO regimes, despite mouthing left-sounding rhetoric in the process, have reduced Iraq, Afghanistan, Libya, and Syria to civil war and chaos. The fruits of their imposed vision of an “open society” with “free markets” is not prosperity and freedom but poverty, chaos, and endless civil war. However right-wing and conservative the governments of China, Russia, and Iran may seem, the societies they have created are ones in which profits are not in total command, and providing a decent life for the masses of people remains a priority. In the anti-imperialist regimes, the state is independent of market forces, and has the ability to restrict and control their actions. Meanwhile, a sense of collective vision and obligation exists, and people are not left isolated to fend for themselves. Yes. the CFR’s vision of a clash between the “open international community” and the “populists” is certainly accurate as it is playing out before the world. Syria is simply the most visible battlefield.